African Futurists meet to discuss the current trends – and the future offcourse! For a while now I have been part of the African Futurists community. I met Geci who is the lead at the South Africa Node of the millennium Project in May 2012 at a meeting Rockefeller grantees from the South – South regions had come together for a conversation to talk about the future. For about a minute I was lost – I was seated amongst people who visibly had met before but more than that, had a different understanding of what was going on around the world and the continent and expressed it in a different way. They were talking about the future and they were talking of futures methodologies. Now where I come from – You trust God with the future. You don’t plan as far ahead, you live for now. I don’t know if it is a culture thing or if it something that we don’t like to do. Now you will see this from how we don’t save, and how we have ministries of ‘disaster preparedness’ that start to plan for a disaster – just right after it has happened. One wonders if they sit around and wait for it to happen before they can take care of it instead of studying and knowing what could happen and then planning to take care of it. Development as evidenced here. This last week – I got to meet some of these people again. And a lot hadn’t changed. Their passion for the continent is visible. First question we were asked was: why should Africa take note of you? Interesting question. We take so much time criticizing the people and the systems that are not going right. But do we ever get to evaluate our contribution to the continent? I am reminded of this cartoon that I saw recently. It was one of a man standing in front of a crowd. The man asked two questions and the body language of the people he was talking to said it all 1. Who wants change? – Everyone’s hand is up in the air. 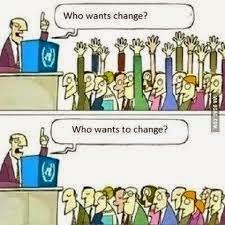 2. Who wants to change? No arm is up. If we are unable to evaluate our contribution to the purpose and cause that we stand for – will that change when we have grown and have ‘big offices’ to run? Will we have acquired the skill by then? I doubt that. And the future will blame us. The future of small states – boundaries of these states that exist are inherited from the colonialists. They have been declared sacrosanct but they are not at conducive for integration. The donor and aid trends; Africa continues to be the most advised yet most under performing continent. Why is this? This is a state of affairs that has been for a long time. Job creation- need for alternatives: we need to work on new business models that are for Africa and by Africa. This also means that we take on new development local projects that are not the ones that have been handed down to us by the donor agencies. Evaluating where we are at and using that to create the change that we need / ought to see and be is very important.The state of our cities – research has been shown that by 2030 – 60 % of the African continent will be living in the cities. We pay a lot of attention to governance at the top and forget that there are cities which are states in their own right. Poor governance of states is a problem. So instead of trying to solve issues at the higher level , we could start by dealing with the issues in the cities. The youth as human resource: The youth are important on this continent. The human resource that is the youth is an important aspect of the future and that they need to be a part of everything in Africa. How do we ensure that we utilize them as human resource? It irks my heart for example that the government of Uganda got into a deal with Trinidad and Tobago to supply ‘health workers’ instead of looking out for them here in the country by paying them well enough to make them stay. Should the youth be allowed to carry the historical burdens of the older generation? Foresight involves commitment, consistency, and concerted action, to be useful. There has got to be a deliberate effort in this regard. As a continent, we face very large issues and we need to understand them before we attempt to solve them. Foresight presents such an opportunity. We are in the business of known unknowns, unknown knowns. But we can use all this knowledge to help us attain the change that we need. Transformation occurs culturally and socially and change is not only about technology – it is a 360 fold turn around benefitting all people. The future is important – if we are able to interact with it even before we get there then we will be able to avoid all kinds of mistakes.